Breathing is something we do without thinking, so it’s easy to take it for granted. But as people age, they’re more likely to develop respiratory complications and experience breathing difficulties. Along with this inability to breathe freely and sustain healthy oxygen levels comes a host of other ailments, including elevated anxiety and emotional stress, reduced energy levels, and compromised immune function. Caregivers can help their aging loved ones alleviate some of these symptoms through focused breathing techniques that increase the body’s oxygen levels and ease physical and mental stress. These exercises can alleviate some of the symptoms associated with asthma attacks, high blood pressure, shortness of breath, chronic obstructive pulmonary disease (COPD) and sleep apnea. Furthermore, even healthy individuals can benefit from the calming and rejuvenating effects of controlled breathing. Seniors and their caregivers can practice these techniques together to reap the benefits. Try the three exercises below to find one that is most useful for each of you. Sit up straight, with one hand on the stomach and the other on the chest. Inhale slowly and deeply through the nostrils, feeling the stomach expand with each full, diaphragmatic breath. Exhale slowly out of the mouth. Repeat six or more times each minute for up to 15 minutes. The popular 4-7-8 breathing method has been touted as one of the most effective (and speedy) ways to fall asleep. Some studies suggest that a person can drift off in less than a minute using this approach. Part of the 4-7-8 technique’s success lies in its ability to ease tension and promote relaxation. Practicing the following focused breathing exercise twice a day will help minimize food cravings, reduce anxiety and provide relief from insomnia. Breathe out fully through the mouth, creating a wind-like “whoosh” noise. Keeping the mouth closed, inhale through the nose and silently count to four. Hold this breath while counting to seven. Exhale through the mouth for a count of eight, repeating the “whoosh” sound. Repeat steps two through four five times. Buteyko breathing was invented by a Russian scientist in the 1950s to curb asthma attacks and treat other respiratory problems. Unfortunately, the medical field resisted a breathing technique that could ease symptoms without the help of medication. Since then, people around the world have embraced Buteyko breathing specifically because it is natural and very effective. Thousands have reported relief from asthma, sleep apnea and hypertension by integrating this proven method, which balances the body’s oxygen and carbon dioxide levels, into their daily routine. As a note, it is best to have senior patients initially perform this exercise under supervision to avoid improper technique that can result in hyperventilation. In a quiet, comfortable place, sit up straight and focus on breathing. Keeping the mouth closed, inhale slowly through the nostrils to fill the lungs. Exhale through the nostrils, slowly expelling air from the lungs,until you feel compelled to inhale. Repeat steps two and three five times. When patients begin using daily breathing techniques and notice positive results, they often stick with the program. Missing a day or two is acceptable, unless it affects a person’s whole routine and causes them to slip back into old, shallow breathing habits. Tracking progress with a diary can help you stick to your routine, recognize improvements and note any significant changes in your health. We breathe more than 25,000 times each day, so it’s easy to get lazy when it comes to this largely involuntary process. 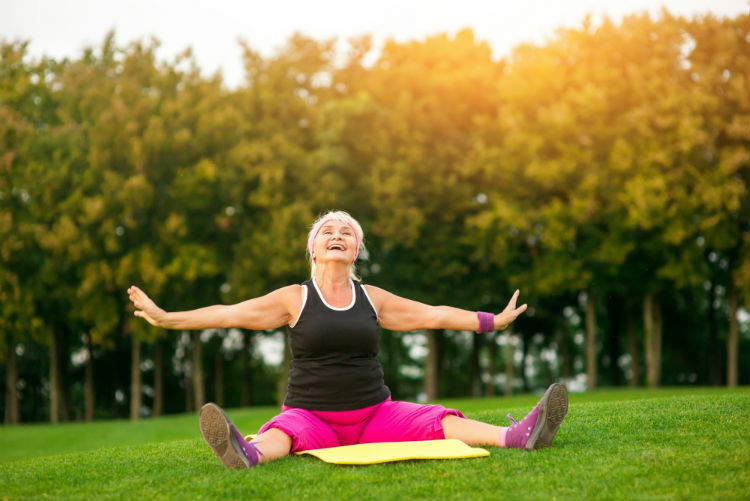 Using these breathing exercises, seniors and caregivers alike can shake old habits and develop new ones that lead to improved physical health and a renewed sense of mental alertness and clarity in only a few weeks. Why Do People Die from Alzheimer’s Disease?